﻿ E-ink-Reader. Reader application on your phone screen. Sometimes you need (or want) to read some books, but you don't have a computer, a tablet, an electronic book or a smartphone on hand. There is only an old and simple phone. What to do? There are several programmes (they're called widgets in the phone) which enable to do it. Some of them show only the text without formatting and work only with text (.TXT) files, other can allocate titeles and support several formats. Let's study these programmes in detail. Tequilacat is a very old programme, I used it about 7 years ago. At that time the version of this programme was called tcbr-2.2.27-2.3.5.zip. The programme was downloaded into computer and then there were downloaded books. 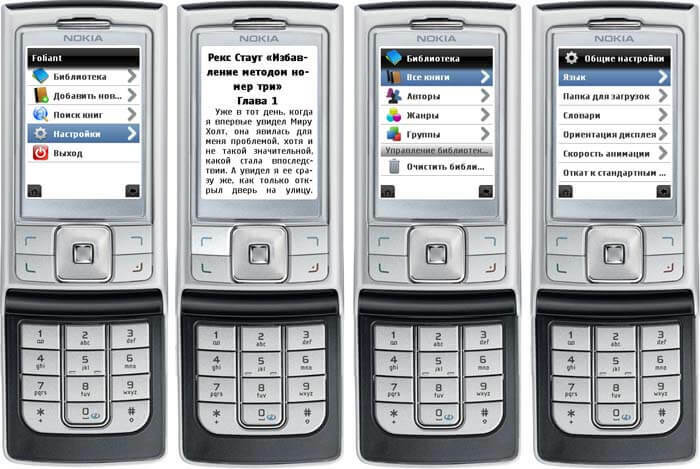 After that you needed to choose the model of your phone (with supporting of java language) from the list and then the programme prepared a widget for your phone, which enables you to read from the screen. Besides, you could make an empty widget without the text and text files and FB2 files were opened from the phone. This version of the programme was made for the phones with buttons. The last vesion (3.0.9) works well with sensory phones too, there's even setting of 9 tap-zones. Supporting of the programme was stopped about three years ago, but nowadays Tequilacat can be downloaded free from developer's site or other sources. Foliant is java app for the phone, which has much ampler opportunities than tequilacat: it supports book's formats .TXT, .FB2 and .ZIP archives, there's sterling show of FB2 books with supporting of styles, allocating of quotes and titles, navigation about the book, showing the table of contents, formatting and arrangement of hyphenations. More over, this app contains a little catalogue, wich sorts the books by genres and authors. You can add the books into this app not only from your phone's memory or SD-cards but from internet libraries too. There's an opportunity of choise of encoding: WIN-1251, ISO-8859-5, UTF-8, KOI8R and DOS in the widget. If you need, you can turn on autoscrolling, manage backlight and change orientation of the text. There's only one but very big disadvantage in this programme, it needs a very big volume of random access memory so it doesn't work correctly in all models of phones. The programme can be downloaded free from some sites. Readmaniak is less powerful and accordingly less comfortable widget for reading from the phone's screen. Abilities of text showin are limited. There is a function of formatting, but the text, epigraphs and titles are shown in the same font. True, there is function of hyphenation. This programme works correctly with phones of brend Siemens, but in many other models you can download the book only with the internet connection what is very uncomfortable. To sum it up, we can say that for every smartphone, tab or electronic book which are managed by operating system Android are written dozens of very good programmes for reading books from the screen. Their abilities are on the order of magnitude higher than all widget which are described here. Among them the programmes Cool reader, Fbreader, MoonReader are the most popular.